In Stock! Ships Today With Free UPS Ground Shipping! The Philips FRx AED Semi-Rigid Carry Case provides the extra protection needed for first responders using the Philips FRx. The Philips FRx Carry Case is a sturdy and well-crafted carrying case that features room to spare, allowing you to include your favorite accessories. A spare battery, electrode pads and the Infant/Child Key can all easily fit inside the Philips FRx Carry Case, ensuring you're ready for whatever the environment may throw at you. 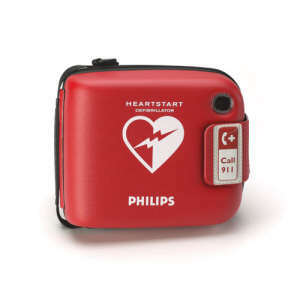 The self-check indicator light of the Philips FRx can also be conveniently seen through the clear window of the case, preventing you from having to remove your AED from the carrying case to ensure it's in working order.